Issued December 8, 2009, to Konami Holding Corp. Battling opponents is a quintessential part of gaming, and U.S. Patent No. 7,628,688 (the ‘688 Patent) helps these battles take place. 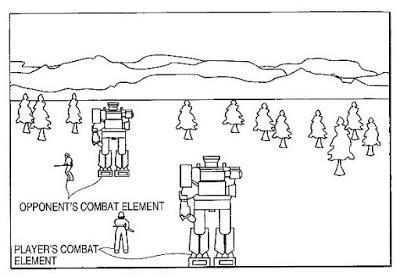 The ‘688 patent describes an image generator used to display both a player and opponent in a state of combat, as well as showing the characters fighting in real time. The patent describes a detector that tracks the distance between a player and opponent. The game will switch normal gameplay and a combat mode based on the distance between players. For example, if a player or opponent enters a certain area (usually within a distance sufficiently close to the opponent), either the opponent or player satisfies a preset condition to initiate a battle. Once the conditions for ending the combat are met (i.e. the player wins or loses), the battle would end and switches back to normal gameplay. The patent describes that the game map has a number of geographic features that influence whether the elements are met for a battle to begin. For example, a character could hide behind a wall close to an opponent and avoid a battle which would otherwise take place. This helps to simulate sneaking around an enemy. An image data generator of this game apparatus generates, in a combat state, combat image data to display player’s combat elements that executes a combat and opponent’s combat elements fighting with the player’s combat elements on the display unit in real time. This game comprises a distance detector that detects a distance between the player’s combat element and the opponent’s combat element at the time of changing a normal state to the combat state, and displays an initial image at the beginning of the combat state in accordance with the distance therebetween. 1. A game apparatus for executing a war simulation game, comprising: a first generator for generating image data to display a normal state image on a preset display, which includes a map, at least one player’s element, and at least one opponent’s element, both elements being positioned on the map; a first controller for activating the first generator when operation data indicating an operation by a game player is sent to the first controller and controlling the first generator to generate the image data for the normal state image according to the operation data; a second generator for generating image data to display a combat state image on the preset display, which represents that one of the at least one player’s element fights against one of the at least one opponent’s element; a second controller for activating the second generator when the operation data is sent to the second controller and controlling the second generator to generate the image data in real time in response to the operation data, wherein the real time generation of image data is free of a turn-based generation of image data; and a selector for receiving the operation data, determining whether or not the operation data satisfies a preset condition, and sending the operation data to either the first controller or the second controller in accordance with the determination wherein the map of the normal state image comprises a plurality of areas, and each of the both elements is positioned in one of the plurality of areas respectively, wherein the second controller determines, according to the operation data, whether or not an area in which the desired player’s element is positioned is adjacent to an area in which the desired opponent’s element is positioned, and controls the second generator so that the displayed combat state image represents the desired player’s element to fight the desired opponent’s element in short-range circumstance when the area in which the desired player’s element is positioned is adjacent to the area in which the desired opponent’s element is positioned, while the display combat state image represents the desired player’s element to fight the desired opponent’s element in long-range circumstance when the area in which the desired player’s element is positioned is not adjacent to the area in which the desired opponent’s element is positioned, wherein the map comprises a matrix form having a plurality of geographic features that exert an influence upon a result of combat between the at least one player’s element and the at least one opponent’s element, wherein the preset condition is whether the operation data includes an instruction that desired one of the at least one player’s element should fight against desired one of the at least one opponent’s element, wherein the selector sends the operation data to the second controller when the operation data satisfies the preset condition, and wherein the movements of the at least one player’s element and the at least one opponent’s element are influenced by the plurality of geographic features of the map.